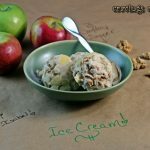 An easy, no egg recipe for ice cream that tastes like Apple Crisp. I am so excited to be kicking off Fall with an apple recipe. To me Fall just screams apples. I love finding ways to use them this time of the year. The possibilities for them are endless. Over the season I’ll share some tried and true recipes I love, and also some new ideas. You all know how much I love to experiment in the kitchen. There is something so exciting about getting in the kitchen with ingredients, some loud music and no plan. Some of the best recipes start out that way. 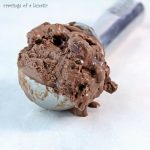 This week I wanted to try a new ice cream recipe. I figure it is Sunday and you know I love my Ice Cream Sundays. I had grand plans to make it all from scratch. My body had other ideas. I’m still recovering from being sick so my energy level is not up to par. I was feeling quite good the other day so I over-did things a bit. I used up all my energy exercising the horse and moving some furniture, which let me just state are two things you shouldn’t do when recovering from being sick. Once my energy was sapped I decided to cut some corners on this recipe. I love doing most of my recipes from scratch but I’m not the kind of gal who is above taking short cuts when need be. People have busy lives, we get sick, or some days you just want more time for more important things, like hanging with the family. So do what you need to do and never feel bad about it. That’s what I did and the result was fabulous. In a stand mixer combine the whole milk, dark brown sugar, and salt. Mix until the sugar dissolves. Add your heavy cream, cinnamon and vanilla. Mix again until fluffy. Cover bowl and stick in the fridge for at least one hour, or overnight. Remove bowl from fridge and transfer mixture to your FROZEN ice cream machine bowl. Place on machine and let it mix for about 10- 15 minutes. Now add the apple pie filling and cereal. Mix lightly. You can serve immediately if you like soft serve, or stick in the freezer for later. If freezing remember to take it out a few minutes before serving so it's easier to scoop. Serve with a big old apple crisp smile! You can cook the pie filling if you want it softer. Just pop it in the microwave for a few minutes or cook in a saucepan until it softens up. You can add the Kashi when serving if you are worried about it getting too soft. It you want that crunch from it this is the way to go. Or just add more when you serve. I have the smaller Cuisinart ice cream machine and this leaks over a tad. So if you have the same one feel free to scoop out a serving of ice cream before adding pie filling and cereal. I have a tendency to overdo things. You can make your own Vanilla Salt for this and other baking projects if you like. If not, feel free to use regular salt. I just like the added taste when I use the vanilla salt. Make sure you stop by all the other Sunday Supper participants for more great apple recipes. A special thank you to our fearless leader, Isabel of Family Foodie for all the hard work she puts into this group. Also a huge thank you to our host this week, the talented Cindy of Cindy’s Recipes and Writings. Cindy is an amazing blogger, really supportive of others and incredibly kind. I had the pleasure of having her guest post for me while on vacation. You should swing by and see her Chocolate Mango Cake while your browsing about. It’s fantastic, such a cool combination. 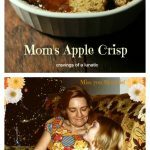 Stop by all the other #SundaySupper participants posts to see the great apple recipes they’ve whipped up for you! I’ll give you an update on my health condition on Tuesday. For now just know I am doing well and am determined to get back to normal life. Thanks to everyone for your support and love. It means the world to me. Also this week there is a fun snack mix coming your way, and finally some vacation photos. I think you’re going to love some of the incredible and insanely cute photos we took while away. Till then get in the kitchen and get your apple on! My mother-in-law just made a similar thing the other week and I thought it was the most genius idea ever. I don’t care that it is cold outside I want to make some. How cool! I think I’m the only one of my family and friends who has an ice cream maker. I need to start giving them to people as gifts. Nothing quite like making your own ice cream. I’ve heard of vanilla sugar, but not vanilla salt. Very interesting. Love your “do what you need to do and never feel bad about it” attitude! Glad you’re feeling better. I do my own vanilla, vanilla salt, vanilla sugar, vanilla brown sugar and vanilla oats. I have problems. Lol. Thanks so much. I’m working my way back to “normal”. Thanks so much. My plan is to slap it on some hot apple crisp! I’m thinking my husband would just love this ice cream. I’m saving this recipe for sure. I hope he likes it if you try it out. It’s pretty cool. 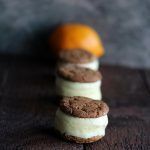 A nice way to have a fall-ish ice cream. You did a wonderful ice cream, sickness and all! The idea of vanilla salt is great, very interesting. Happy Sunday! Thanks so much. I love using vanilla salt on all kinds of things. I have a new ice cream maker, and this might just jump into it! I hope it does. It’s wicked good. Thanks so much. I really had some fun with this one. Plus ice cream heals everything right. This sounds absolutely fabulous! I can’t wait to try it. The only bummer is that I didn’t have it LAST Sunday for my Dad’s 78th birthday. Apple Pie or Crisp is always his request as he’s never been much of a cake lover. I made the Apple Pie, but can you imagine the double heaven if I’d had this ice cream to go with it…? Now, it’ll be like the whole dessert all over again in one element. Thanks for the great recipe! Your dad is so lucky to have you. I’d love it if someone made me apple pie for my birthday. You will have to try this and use it over top of the next pie or crisp you make for him. 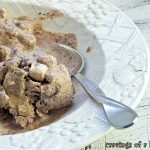 this has to be by far the yummiest ice cream recipe, EVER! I am totally making a triple batch and freezing it but I’m really not sure how long that would last! Awe thanks so much. It’s really good stuff. I don’t think mine will last too long. Love the idea of a fall themed ice cream. Just because the season is changing we shouldn’t have to stop eating ice cream! I’m fighting a cold and I think this would help a great deal. Looks delish! My sentiments exactly. I eat ice cream all year round. It’s just too good not to. Sorry you had a setback, but glad that overall you’re getting better. We need you back to full health and energy! 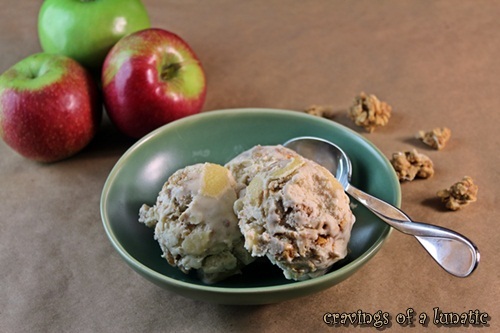 So you can make us more great recipes like this one for Apple Crisp Ice Cream. I really like Apple Crisp, though I don’t think I’ve ever had it in ice cream. 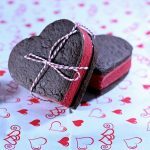 This looks like something I should make! Thanks for this. Thanks so much. Another couple of weeks and I should be totally recovered. I am doing great, I just get tired easily. Each day I get a little stronger though so it’s progress. You should try this. I bet you could put a unique spin on this. It’s a cool ice cream. wow I love this recipe!! We love our ice cream maker and my husband will drool over this. Thanks so much. You gotta try this out for him. Glad you’re back in the kitchen again and sharing your amazing treats! This ice cream looks delicious! Thanks so much Anna. I am happy to back. Brilliant! You truly are the kind of crazy I adore!!!! YUMMERS! Kim you’re so creative! This is such an awesome and unique ice-cream! The crunch from the cereal would just make me smile!!! Happy #SundaySupper! Only you would turn this week into an ice cream week. Of course, this is also the reason I adore you!!! 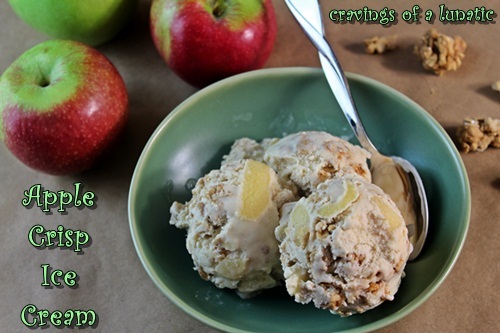 I love apples and I love cinnamon;this ice cream just calls my name! So glad to hear you’re getting better. Hey, there’s nothing wrong with a few short cuts. This ice cream looks fabulous. Happy #SS! Pinned. This icecream sounds outrageously delicious and I love how simple it is to make. Yes, I think Autumn can get underway now that this lovely apple treat is in the bag! Thanks so much Hester. I like simple cooking when life gets busy. I look forward to seeing what you cook up this fall. I can’t wait to try this one! Sounds like a perfect fall flavored ice cream! Thanks so much Patsy. I am so excited to dig into fall baking and cooking. Yummy! I love my Cuisinart ice cream maker…don’t use it as often as I intend to, but this is enough to entice me to take it out of the cabinet and whip up some apple crisp ice cream before the weather turns cool in Texas! Yum! I love creative ice cream flavors, and this is definitely one I’d love to try! Erhmmmmmm, you’re making this for our wedding reception, right? 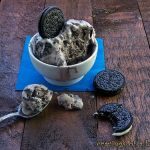 such a creative and delicious ice cream recipe! love it! I love that you made ice cream! 🙂 and that you added cereal! this recipe is awesome! I just started making homemade ice cream myself this year. we will definitely give this one a try! thank you! I love apple crisp and as an ice cream, I’d be over the moon. I love the addition of the crunchy cereal! From when I was young, I have added add Grape Nuts to coffee ice cream but I never knew anyone else who did. Happy to have another lunatic join me. 🙂 Every single one of your ice cream recipes sounds delicious so I am surely in good company. Oh how I wish I had an ice cream maker! This sounds fabulous! Now I feel just awful! I’ve been so out of the loop lately that I didn’t even know you were sick! Hope you are on your way to feeling better. Big hugs! OMG, that looks great!! I love homemade ice cream!! You always make the best ice cream! I want a giant bowl of this right now! I must be losing it…I thought I had commented :/ Must have been on G+. I love how you made ice cream and I made a cookie bar…some things never change! Enjoy your week! You’re SO creative! Love the apples and the cereal addition! what a fun ice cream!!!! Can I have a scope of it now! This is so tempting…..Great recipe! Every time I open my freezer, the bowl of my ice cream maker stares me down, wondering when will I use it again. Looks like its time has come! Love the pics and the way you scribbled the ingredients. Makes me want it more. Delish ! Amen for shortcuts! We all need ’em every now and then. I hope you’ve recovered from being sick, especially so that you can enjoy this delicious ice cream. Seriously – it looks fan-freaking-tastic! so cute how you wrote the ingredients on brown bag paper! I love the sound of an easy ice cream recipe that doesn’t invlolve an ice cream maker cuz I don’t have one. 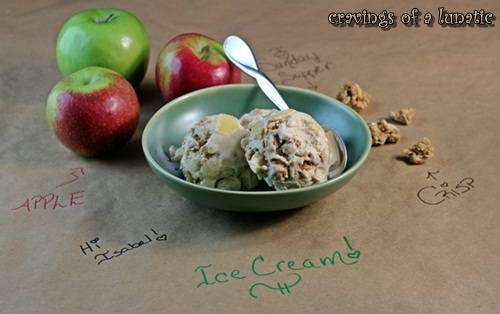 Apple pie filling and cruch cereal really just takes this ice cream to whole new level. Such a creative ice cream! I’m sorry that you still aren’t feeling well, but I could never tell Kim, you most certainly brought your A game out for this recipe! Wishing you the best and hoping things get better soon. What a fun way of using Kashi’s Toasted Cinnamon Crisp cereal!! love it. I hope you feel better soon, Kim. What a great way to use apples. I can only imagine how good that bowl of ice cream tasted. 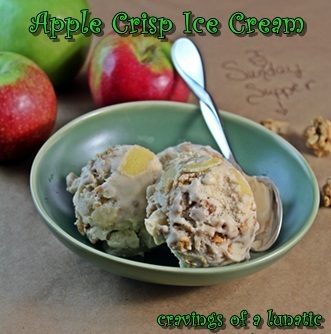 I adore both apple crisp and apple ice cream so this is an automatic winner for me! I love ice cream! This looks wonderful! Wow I can’t even imagine how good this ice cream must be! Awesome job!